When individuals of influence, including political candidates and heads of state use such words, the consequence can be especially pronounced. In the run-up to, and since his election as President of the United States, Donald Trump’s words have attracted a lot of attention. Many commentators and activists have charged that Trump’s rhetoric has fueled hate crimes in the United States against minorities. Until recently, many individuals voicing such concerns pointed to high-profile individual cases, rather than systematic data. Now that’s changing as new research is emerging. Hatewatch spoke with Karsten Muller and Carlo Schwarz, two researchers at the University of Warwick in the United Kingdom who have been studying the impact of hate speech on social media and how that translates to hate crimes in the real world. Muller and Schwarz discuss their latest study, "Making America Hate Again? Twitter and Hate Crime Under Trump"
Their study used Twitter and FBI hate crimes data to come to a stark conclusion: hate crimes against Muslims and Latinos occurred shortly after Trump made disparaging tweets about Muslims and Latinos. Moreover these anti-Muslim and anti-Latino hate crimes were physically concentrated in parts of the country where there is high Twitter usage. Karsten and Carlo, can you give us an overview of your research interests and your recent study on President Trump’s tweets and Muslim hate crimes? Carlo: We are economists working in slightly different areas, but we both have an interest in what people usually call political economy. What we try to do is to apply modern quantitative methods to study political outcomes and the role of social media. In our most recent study, we find that the number of anti-Muslim hate crimes in the U.S. has increased quite markedly under Trump. 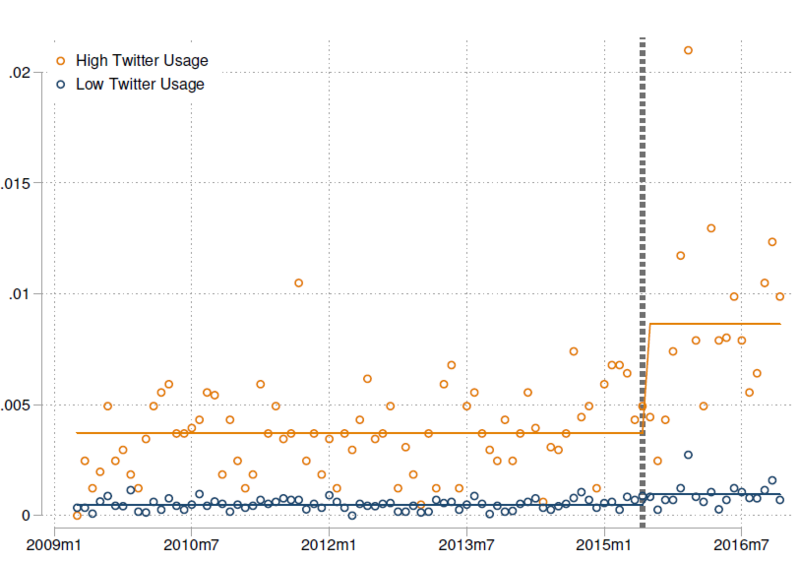 We show that this increase started with the beginning of Trump’s presidential campaign and is predominately driven by U.S. counties where a large fraction of the population uses Twitter. The data also show that this increase cannot be easily explained by differences in demographics, votes for Republicans, crime rates, media consumption or other factors. Karsten: The second thing we do in the paper is to look at the correlation between Trump’s tweets about Islam-related topics and hate crimes that target Muslims. And what we find is that this correlation is very strong after Trump had started his campaign, but basically zero before. We also find that when Trump tweets about Muslims, hate crimes increases disproportionately in those areas where many people use Twitter. It is also important to note that hate crimes against Muslims were not systematically higher in those areas during previous presidencies, so it seems unlikely we are simply capturing the fact that people in some areas dislike Muslims more than in others. Are you claiming Trump’s tweets have caused hate crimes? Karsten: We are very careful not to make that claim in the paper because I think it is extremely hard to tell based on our data. After all, we are not looking at a controlled laboratory experiment so there is always room for other drivers. But if you look at the results, some point in that direction, for example that Trump’s tweets are particularly correlated with future hate crimes in counties where many people use Twitter. Carlo: A simple thing to do here is to think about what alternative stories could explain our findings. For example, one could imagine that people who Trump himself follows (such as Fox & Friends or Alex Jones) are the real driving factor. Or that people have recently become more radicalized in rural areas, or where the majority votes Republican. But a careful look at the data reveals that Twitter usage is in fact lower in counties where people tend to vote Republican and in rural areas, and we use some survey data to show that Twitter users generally prefer CNN or MSNBC over Fox News. These factors also cannot easily explain why the increase in anti-Muslim hate crimes should occur precisely with Trump’s campaign start and not before or after. Karsten: So overall, we take our findings as suggestive of a potential connection between social media and hate crimes. But at the end of the day, readers have to make up their own minds. What were some of the other key findings that stood out with regard to Muslims? Karsten: What really stands out to me is just how strong the correlation of Trump’s tweets is with future anti-Muslim hate crimes. So, for example, one might be worried that Trump simply tweets about Muslims when people are generally very interested in everything related to Islam. But what we find is that Trump’s tweets are correlated with hate crimes even if we first even if we control for the effect of general attention to Islam-related topics (as measured by Google Searches). 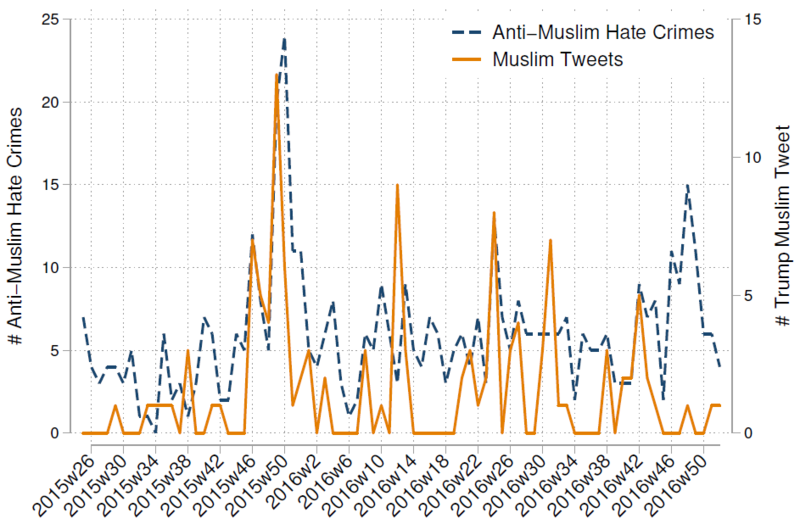 Although there are other explanations, I also found it striking that you see a spike in hate crimes against Muslims in the week of the Presidential election, but only in areas where many people use Twitter. Carlo: Another thing I found quite interesting is that Trump’s tweets about Muslims are not correlated with other types of hate crimes. The reason this is important is because one could easily imagine that people just happen to be particularly angry at minorities in some weeks compared to others, and that Trump is just part of that. But if this was true, we would also expect there to be more hate crimes against Latinos, or LGBTQ people or African Americans, which does not seem to be the case at all. We also do not find any evidence that other types of hate crimes increased in areas with many Twitter users around Trump’s campaign start — except a small shift for anti-Latino crimes. Your study also noticed a statistically significant association between anti-Latino tweets and hate crimes. Why do you think there has been a similar, but less robust set of results? Karsten: When we started our study, we only had data on hate crimes until the end of 2015 — after Trump’s campaign started in June 2015, but before his election. And what you see in the data is a very strong correlation between Trump’s tweets about Latinos and subsequent anti-ethnic hate crimes starting with the beginning of his campaign until December 2015, while there is virtually no correlation before. After the 2016 data were released, we found that the effect becomes substantially weaker from around mid-2016 onwards. Carlo: When we looked at that more closely — and we think that is consistent with the media coverage during that time as well — Trump toned down his anti-Latino rhetoric quite a lot in the run-up to the campaign. There was, for example, his tweet with a taco bowl on Cinco de Mayo 2016. If you go through Trump’s Twitter feed in the pre-election period, you will see only a handful tweets about Latinos at all during that time. And while hate crimes against Latinos remained slightly elevated in areas with many Twitter users during that time, that means the correlation with the timing of Trump’s tweets became weaker. A potential interpretation is that it is not that the results are so much weaker than those for anti-Muslim hate crime, it’s just that Trump essentially stopped tweeting negative things about Latinos. How does this study compare and contrast with your earlier investigation into the online activities of the far-right and nativist political party Alternative for Germany (AfD)? Carlo: In our study on Germany, we found a very similar correlation between posts about refugees on the AfD’s Facebook page and crimes targeting refugees. We look at these two studies as complementary, even though they use somewhat different methodologies. In the German setting, we have very granular data on internet and Facebook outages that we can use as “quasi-experiments” to get at the causal effect of social media. And what we found there is that, even if you compare neighboring cities, refugees are more likely to be victims of violent attacks where many people use social media, particularly when tensions are high. Importantly, these are relative effects. What is different for the U.S. is that we find this link between Trump’s campaign start and the increase in the absolute number of hate crimes against precisely those minorities in his verbal crosshairs (e.g. Muslims and Latinos), making the link by using Trump’s tweets. and FBI hate crimes dataset. By using the FBI hate crimes statistics, it also allow us to compare the recent change in hate crimes to those under presidents since 1990s. For civically conscious users of the internet, what are the most important takeaways and implications from your research? Carlo: On one hand, our goal is to suggest that politicians should not ignore social media, because the correlation with real-life hate crimes seems to be pretty strong. We think that this discussion should be taken seriously. On the other hand, we want to caution against any attempts at censorship. Some countries have an outright ban on certain social media platforms, and these states are usually not known for their open political discourse and freedom of speech. The challenge is to come up with solutions that can help protect citizens from violent extremists without imposing drastic limits on freedom of expression. In the end, the people who actually commit hate crimes are the ones we have to hold accountable. Karsten: I want to give a somewhat different perspective here. Many people talk about a potential “dark side” of social media, but the number of studies that have actually looked at this issue with data is surprisingly small. One of the most important takeaways for me is that as a society we should be spending more time and resources to support researchers working on this area. It is clearly something that many people care about, and it matters tremendously for policymakers as well. What do you plan to do next in your research? Karsten: We think a big open question is to come up with more concrete ways of measuring whether “echo chambers” on social media really exist, and how they differ from echo chambers in other domains. If social media is indeed different, the question is what can be done to get people to consider information from outside of their bubble. Our data for Germany in particular will hopefully also allow us to show how exactly online hate on Facebook is transmitted in practice.